The ManCan 128 Flex kit serving system from ManCan is a perfect, pour anywhere mobile draft solution. 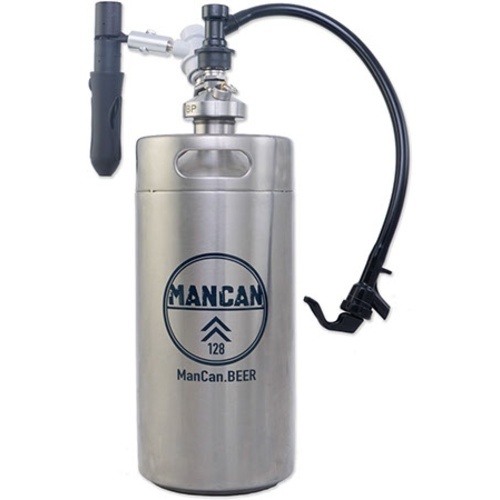 Featuring a one gallon (128 oz) SS ManCan Mini Keg growler, a perfect pour 2 stage Regulator, and a serving line; this is a go anywhere package that will keep your beer serving beautifully. The upgraded top attachment allows you to carbonate and serve beers using custom ball lock connection packages (all included). The Perfect Pour regulator maintains a set PSI output, high enough to push your beer out and retain carbonation, but low enough to eliminate foam while pouring! The regulator takes 16 g co2 cartridges (2 included) and package includes 3 cleaning tablets. Cool way to take beer to a party. I also got my Mancans through Kickstarter. The company's support email and phone are shut down as I'm writing this. Per a post from 6/18 on their Facebook wall, they put up a GoFundMe page asking for help to save the company. Claimed they were getting screwed over by the regulator manufacturer. As mentioned, great except the regulator. You will be purchasing a faulty product with no support if you buy this. I purchased 2 of the ManCans through Kickstarter. I have already had two regulators replaced and both eventual no longer work. non adjustable pressure. The Growlers themselves are nice and very well made, however the regulator is garbage. I received 2 of the Mancan 128's with the flextap off of kickstarter so my price was discounted although they have been having sales off and on during holidays. First off, this mini keg is VERY rugged and durable. if you want to take it camping, hiking, or throw it in a boat then it'll be no problem. Just put the regulator and tap in a bag or something protective and toss the keg wherever you want. The multiport tap, as they call it, screws on top and is quite heavy. I've been afraid of breaking a glass shelf in my refrigerator because it gets quite top heavy the more you drink and could fall over if not careful. Speaking of refrigerator use.. this thing is 16.25 inches tall with the flex tap in place, so measure your fridge first to make sure it'll fit. It's 5.25 inches wide so not many problems there. Second, this mini keg is great for homebrewers. If you are really just wanting this to fill at growler bars to take beer home, then maybe the UKeg is better for you. Otherwise, the Mancan is awesome for pulling a gallon off of your batch to experiment with! Or if you're just a one gallon brewer then this will be great for you too. Force carbonation with this like any other keg. You'll need a larger co2 tank for that as the perfect pour regulator is only meant for serving beer. I enjoy keg conditioning in these as well if I have the time. I should mention that the perfect pour regulator is not adjustable and it only takes 16 gram non-threaded cartridges. A little trick is to cut a dispensed 16g cartridge off at the neck and a 12 gram will slide inside it perfectly and they're a heck of a lot cheaper. Also, by now, you will get the beefed up regulator. I haven't had any issues with them. Get the flex tap model instead of the perlick tap because you can just buy a faucet quick disconnect assembly (Item #: KEG902) and have the luxury of being able to swap out between the two. I almost docked one star for the price since you can buy a 1.5 gal torpedo keg, portable regulator, and flextap for much cheaper. But... this is a very aesthetically pleasing and well designed product so I held myself back. This product works as intended. I would recommend it, although it is expensive. I was very anxious about my purchase due to the feedback related to the "old" regulator. However; I got the "new" regulator which was sent out around January 2016. The pours are fairly consistent, most are about 1/2 inch . Regulator has a slight soft click, click sound as it automatically releases CO2 into the canister as needed. The weak point on the regulator is a bit scary. The instructions give adequate warnings on how to hold the regulator to prevent breaking it. I think that part of the design is need of improvement. Due to the size with all connections attached its not practical for me to put in the fridge. I have to disconnect the CO2 and lay the can horizontally. Not a big deal - but with the risk of bumping the regulator at the weak point I rather just attach the cartridge when I am using the Mancan. I leave the hose attached. The on (green)/off (red) button on the regulator is nice. Switch it off when not in use. I was allowed to take the can with my homebrew into a local pub. Everyone was impressed with both the brew and the presentation. I will make you proud. Besides the weak point, and the price - the product is a go for me ! Note: i was extremely disappointed that Morebeer could not have tried one of the cans and provided some feedback to their customers, especially for a product at such a high price point and with no other reviews out there. It was a big risk for me to purchase - especially during the time Mancan had issues with the regulator. I took the risk and feel that it paid off . (I am out of Country - so I do not have the comfort of the "just sending it back" if not happy option . All is well that ends well.